Business school will teach you that one of the essential aspects of marketing is building and establishing a brand. Successful application of this would then be to create something so iconic that it becomes immediately recognizable as your own, think Jordan and the Jumpman logo, Michael Jackson and the single sequinned glove or McDonald’s and the famed golden arches. In cinema, there are plenty of examples of director trademarks like Tarantino and hyper-violence, Bay, and explosions or Shyamalan and twists but few have created a brand quite like Wes Anderson. Celebrating his 48th birthday today, the eccentric director has crafted a visual style that is distinctly his own. Like a signature or a world famous logo, when you see his films, it is not simply just a film but a Wes Anderson film. This aspect of his filmmaking is also his most polarizing. In fact, introductory film texts and indeed film school will tell you to avoid symmetry in your filmmaking for it is unnatural to the human eye and gives off the feeling of being unrealistic. Anderson does not take this into account subverting traditional pillars of filmmaking and in doing so has placed a signature (as he would put it) on his filmmaking style. The anti-Anderson crowd would be quick to dismiss this as the director trying to strip filmmaking of its meaning in service of crafting the perfect shot effectively cannibalizing substance for style. I would argue that Anderson makes these choices not to seem eccentric or stand out from the crowd but he does so because he creates his own worlds. In these worlds, everything is visually perfect even though his characters are decidedly not. Through his unique style, Anderson is able to transport you to his world thereby providing the audience with a sense of escapism. The warmth of his chosen color palettes contributes to this effect as there is a sense of nostalgia and comfort in the way scenes are composed. Like flipping through a children’s book, the color scheme has a welcoming effect on the viewer effectively allowing them to immerse themselves in Wes Anderson’s carefully crafted world. 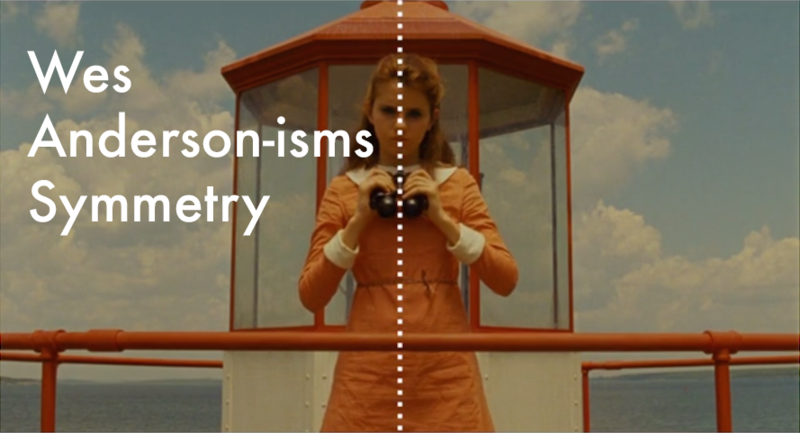 Of course, a lot of Wes Anderson’s visual style has to be credited to cinematographer Robert Yeoman. In conjunction with the shot composition, set design, color palettes and everything from props to wardrobe play a large part in creating the Anderson aesthetic. In contrast to his visuals, his characters are often outlandish, cartoonish even, they are stretched to the extreme boundaries of being human yet they are still surprisingly real. Like Bill Murray’s Steve Zissou who is haunted by the creature that ate his friend or the feeling of first love between Suzy and Sam in Moonrise Kingdom, these characters live and feel just as we do even when things around them look perfect. In this, I think there is a reflection of life. When we examine the lives of others we see the tip of the iceberg, we see the carefully crafted Instagram photos, the meticulously selected selfies in what would on the surface seem like a perfect life. We like to present ourselves as perfect but the reality is we are not, beneath the surface everyone has their own set of insecurities and flaws. Wes Anderson’s characters then are much the same, flawed in many ways but existing in a seemingly perfectly constructed world. As we watch each of Anderson’s movies, we see the flaws in these characters but as much as a character is developed through action and dialogue, a lot is said without words through the character’s wardrobe. Take Gwenyth Paltrow’s Margo Tenenbaum from The Royal Tenenbaums, Her frumpy hairstyle, wool coat, cigarette in mouth look denotes the idea of a cold loner that she does not care how she looks yet still looks cool. Similarly, Gustave’s well-manicured facial hair and carefully fitted wardrobe (even in prison) from the Grand Budapest Hotel tells you he cares about the way he looks, is perceived as a well dressed handsome man and his status in the hotel is reflected as such. Anderson pours over these details because he knows they add up, every pixel of the frame contributes to the overall feel. This is why his set design is immaculate, his attention to detail is almost sublime because without these operating together in harmony his vision is not complete therefore it would not be his signature on the film but rather a forgery. An insult to his very name, his brand, unless it is exactly as he envisioned it to be. Wes Anderson revitalized Bill Murray’s career. Aside from the sepia-toned layered shots, the symmetry of the shot composition and the extravagant color palette choices, the one single constant in Wes Anderson movies is Bill Murray. Appearing in every Anderson directed movie with the exception of his debut Bottle Rocket, Murray’s career renaissance began in conjunction with Anderson’s rise to prominence in Rushmore. Playing the wealthy but depressed Herman J Blume, the dramatic side of Murray’s range was unlocked that we had only seen in small spurts previously. The wounded yet profound deadpan- depressive found in Rushmore would be a calling card for Murray as he would play similar characters while turning in some of the best performances of his career in Lost in Translation, Broken Flowers and Anderson’s The Life Aquatic with Steve Zissou. Take this scene from The Life Aquatic where Anderson lets Murray drown in his emotions all while set to Sigur Ros, it is the culmination of all the emotion the story has built up, the sense of loss and emotion is all over Murray’s face yet there is a feeling of tranquillity and release. At this moment Anderson’s visual style never overshadows the power of the moment. 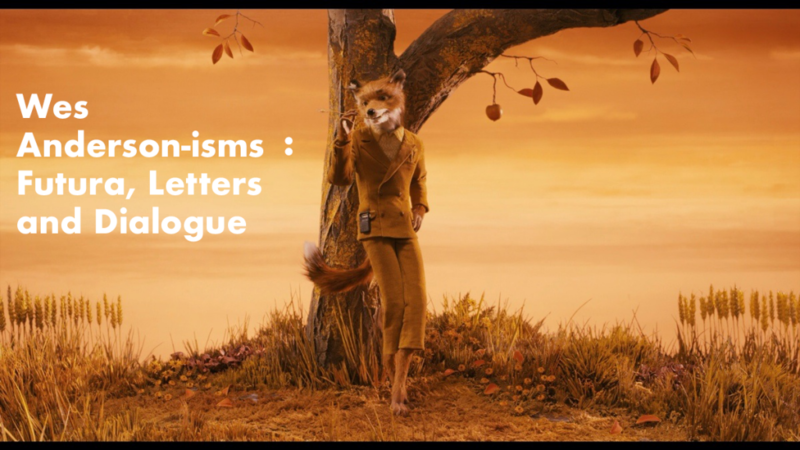 Yes, the film is undoubtedly quirky, undoubtedly Wes Anderson in its design but that doesn’t stop his films from possessing the emotional depth and intimacy that marks a great film. That speaks to Anderson’s vision for his projects, he sees them as his own, a product of a very specific idea brought forth in his head. The relationship between an actor and a director is best when it’s symbiotic, sure, a good actor can cover a bad director’s flaws (and vice versa) sometimes even creating decent movies but the best movies are born out of a passionate idea that the entire team buys into translating from the page to the screen. 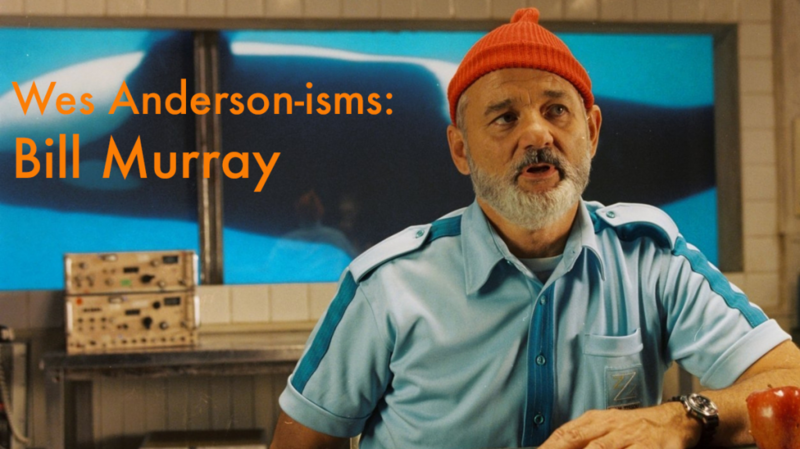 It’s clear that Anderson and Murray have such a relationship through their many collaborations together and in the process, Anderson has created a framework for Murray, a character archetype that he excels in demonstrating Murray’s dramatic range alongside his legendary comedic abilities. Wes Anderson loves Futura font and we’ve tried to honor that in our graphics on this piece. He has now trademarked the setting title card using it extensively throughout his work. Like the Futura font, Anderson’s dialogue is often very blunt and to the point. Deceptively simplistic Anderson’s dialogue can at times feel like a David Foster Wallace monologue (complete with footnotes) in its complexity but it there, much like Wallace’s novels, he is able to find moments of comedy. In this scene taken from Moonrise Kingdom, we see the awkwardness of being a teenager, neither character speaks like a typical teen would but that only furthers the awkwardness. As we previously discussed, Anderson likes to extend his characters to the far reaches of the human spectrum, they magnify our insecurities and show them off through exaggeration. Here, in The Darjeeling Limited, we see a scene that is not unlike typical siblings fighting just amplified to comedic cartoonish extents. The people are weird and wacky but that doesn’t make them any less relatable. Sometimes we may want to mace the people we love in the face as well, in moments of anger we might even consider worse actions, the difference is we don’t act on these impulses and Anderson takes these moments and turns it into comedy. That’s the kind of movie that I like to make, where there is an invented reality and the audience is going to go someplace where hopefully they’ve never been before. The details, that’s what the world is made of. To confine Wes Anderson to simply just an art house director or one with style without substance would be failing to understand Wes Anderson’s brilliance. In terms of technique, He still possesses many of the fundamentals that the great filmmakers have, he just goes about it a different way. Analyze this scene from The Royal Tenenbaums and you will find a bevy of excellent uses of camera movement and shot variation worthy of being shown in any introductory film course. Often times Anderson is pigeonholed into being this strange hyper-niche filmmaker who does things that go against the grain, appealing only to hipsters and film nerds but at its core, he doesn’t stray from strong storytelling and emotional resonance in his films. His style may create his worlds but it is his characters that define them and they are still undeniably human. Akin to a children’s book that secretly passes along moral lessons, Anderson presents the very idea of being a flawed human being, he just does it under a far more beautiful lens filled with painting esque imagery, vibrant colors, and whimsical music. In a career that will see him release his 9th feature film next year (Isle of Dogs), there are imitators and impersonators but there is only one Wes Anderson.